A living fossil found in Australia! The genus Wollemia was only known to scientists as a fossil until 1994, when David Noble, a hiker and officer of Wollemi National Park, discovered a grove of Wollemi pines nestled in a sandstone gorge in the Blue Mountains of eastern Australia. Amazingly, this gorge is only 150 km from Sydney, Australia! Fewer than 100 individuals were discovered. Since the discovery of Wollemia nobilis, seeds have been collected and plants grown with the intent to release the plant into cultivation and thus distribute it widely to ensure the survival of the species. You too can be a part of this extraordinary conservation project (if interested just type “Wollemi pine” into any search engine to find vendors). As a member of the Auracariaceae, the Wollemi pine is not actually a pine at all, but rather a close relative of the monkey-puzzle (Araucaria araucana) and kauri (Agathis spp.). Wollemia, Agathis and Araucaria are the only three remaining genera of this ancient family (unless a new discovery changes things again!). The fossil record dates the Araucariaceae back to the Jurassic period (approximately 200 Ma ago) where it reached its peak diversity and existed nearly worldwide. The Wollemi pine is dated back to the Cretaceous period (approximately 140 Ma ago) from the fossil record. Along with the passing of the dinosaurs, the Araucariaceae vanished from the northern hemisphere and members of the family are now found in only the southern hemisphere unless cultivated. Wollemi pines have a wild habit of growth. They often have multiple trunks making them bushy but will grow to 40 meters (130 feet) in the wild. In cultivation, one can expect a much shorter height. 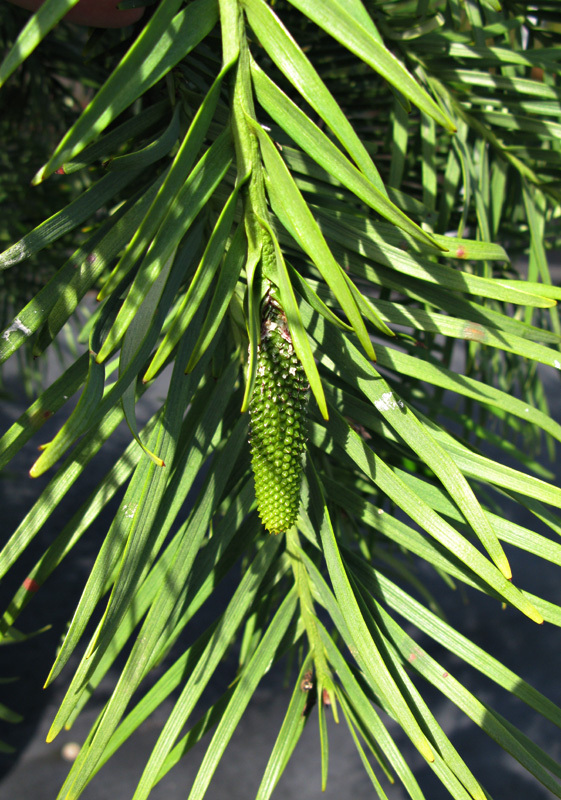 The photo accompanying this article is of the male cone from a Wollemi nobilis in the UBC Botanical Garden collections. This plant is under quarantine until mid-2009 as it was imported with soil. UBC Botanical Garden received this plant via Dr. Susan Murch — it is grown from one of the original cuttings of the oldest living Wollemi pine, “King Billy“. Daniel Mosquin took this exquisite photograph, Thanks Daniel! And I also took this video… please ignore the fact that I can’t count and talk at the same time. Wollemia nobilis in an upside down position because it’s native growing area is “down under”? The shoots with cones (both male and female) are slightly pendulous – the pic shows it ‘as it is’. I believe this is the first time I’ve seen a video added. Nice addition Daniel. And thank you too Ruth. The branch was held to take the photograph (it was windy), but I don’t recall adjusting the position of the cone too much. It’s pretty close to “as is”. And yes, this is the first time I’ve tried a video. The faculty has some new devices that make recording and downloading videos easy-breezy. This was a great entry. Loved both the picture and the video. What do I notice on the leaves in the photo? Insects? What is its hardiness? As an amateur dendrophile who used to live in Vancouver and now lives in Australia, it was great to stumble on your blog and find you reaching across the Pond. Cultivated individuals of Wollemia nobilis used to be displayed only in cages because they were so rare, but Australian gardeners now seem to be buying them in abundance. I’d be interested to know how they grow in BC. The rich volcanic soil you have is quite unlike anything in Australia. My own blog might interest some of your readers, as I’ve lately been botanizing in New Caledonia, a tiny land that has the greatest diversity of Araucauria and Agathis, as well as many other families. Probably dozens or hundreds of bushwalkers had walked through this location and never realised that the trees were unique. One problem is the lack of genetic diversity which makes the risk of fungal infections wiping them all out high, so access is restricted. For some photos of similar country see http://www.kjbeath.com.au/photos/wollemi/index.html One of the few places left where it is possible to believe that someone hasn’t been there before. I wouldn’t describe Wollemi as being part of the Blue Mountains. Morris: It’s g’day, actually!Jarrett: It was displayed in cages so that people would not steal vegetative material whilst the commercial material was upcoming; it was almost funny how quickly the cages were removed once the impetus of the commercial releases and the hype had subsided. The various original wild individuals were propagated and sold at obscenely high prices under individual code designations.The prices have come down to normal commercial levels now. Ripping off the horticultural public is a menace. The movie helps give the essence of the tree better than the still photo–I mean the way it moves in the breeze. I first saw one under glass at the Missouri Botanical Garden. I will be interested in finding out how it does in British Columbia. If it does well there, it should also do well in NW Oregon. The story reminds me a lot of that of the Metasequoia. Well, I’m not sure that it is “ripping off”. The new and the rare always come at a premium. But, it appears that we are not quite at “normal commercial levels” here in North America, with it going for $99 for a 1 foot +/- start. The vendor site is also not accounting for the fact that the $Cn is not longer weak vis-a-vis the $US because they are still trying to charge half again as much to those north of the border (although they are offering a slightly larger specimen for the extra money). I live in Portland Oregon and have two Wollemis. I purchased the first one when they became available in the US, purchased the second a year later and will likely purchase another this spring. They seem to have different “personalities”, the first one is shorter and wider, more bush-like and the second one is is taller, more like a tree. I was transplanting the second one and accidently snapped off about 6″ of brand new growth from the top about three months. It has recovered nicely, thank goodness. I keep mine are indoors. I tried the newer one outdoors in limited sunlight and it didn’t do very well. It will be nice when the prices come down. A friend of mine here on the Sunshine Coast bought her one-foot-tall Wollemi two years ago, has kept it outside in a pot on her south-facing deck on the waterfront all year round, and it is now five feet high and loving it. We are zone 8B here. Sites right on salt water have high minimum temperatures due to salt water releasing heat at night. It can be much colder a short distance inland. Leaving the rare and expensive tree out in a pot regardless of weather and season seems pretty casual. Wonder if it sat out through this last cold spell, and if so what condition it is in now.